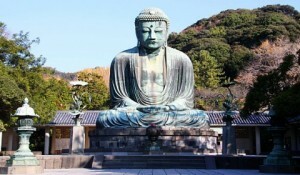 The Great Buddha of Kamakura or Daybudu – bronze statue of Amita Buddha height of 13.35 m, located on the grounds of the temple in Kamakura Kotokuin. Dated 1252. It is the second tallest bronze Buddha in Japan, is the first in the temple Todai-ji Temple in Nara. The first statue of Kamakura Daybudu was made of wood, but it was destroyed in a storm in 1248. Two of the best casters of the time – It Goroemon and Tanzi Hisatomo – offered to cast the statue in bronze, which was done. The statue is seated in the lotus position Buddha fingers of his hands depict meditation sign – an image showing the calm and power of faith. Inside the statue is hollow, and anyone can go inside. Once the statue was located inside the spacious church building, but the complex was repeatedly disrupted by frequent typhoons (in the XIV and XV centuries.). As a result, it was decided to leave the open-air statue of Buddha.